On the morning of the departure from Prague to the Amadeus Royal boat, we left our luggage outside our hotel room to be picked up by the crew and brought to the bus. After breakfast, we still had time to briefly do any last minute sightseeing or shopping. From the hotel, we left for Nuremberg at 1 p.m. on 3 separate buses. Halfway through the 3 hour bus journey, we stopped at a McDonald's in Germany, yes McDonald's, for a food and bathroom break. It was a good size location, but it must be on the main highway as it was crowded and it took awhile to place our food order. They took Euros and credit cards. After a quick 20 minute stop, we boarded the bus for the 2nd half of the drive to the Nuremberg port, also known as the Main-Danube Canal, and arrived by late afternoon. The embarkation was painless as our 3 tour buses left Prague in a staggered formation so as not to all arrive at once. The receptionists welcomed us, we gave them our passports, and they gave us a key to our cabin and a key to a small safe in the cabin. Between my husband and I, we were given only 1 cabin key and 1 safe key. These were physical keys and not electronic card keys. The cabin key was attached to a huge keychain so it would less likely to be lost, but you will need a big pocket. As a policy, they kept our passports for the rest of the cruise until we disembarked in Budapest. We had reservations about it, but it was a requirement so make sure you make copies of your passport before you leave home just in case. And, at no time during the rest of the cruise were we asked to present our passport during our tour so technically we did not need it. After receiving our keys and cabin number, a crew member brought our luggage and escorted us to our cabin. Our cabin was on the Hayden Deck (lowest level) where there isn't much of a view out our window except to maybe look at the sky. If I got on a chair, I could see the landscape and water-level. My thought was how often are we going to stay in our cabin when we are out and about most of the day. With that in mind, we are light sleepers and the engine noise, sloshing of the water, going through countless river locks were sometimes too much and they kept us up at night. Picture from Gate1's photo gallery of a Hayden Deck cabin. Our bathroom which looks similar to those on a large cruise ship except this one has a sliding shower door which I prefer. The shower head and provided soap and shampoo. Also, a hairdryer is provided and stored in the desk drawer. Your cabin is made up while you are away on your day's tour and in the evening during dinner time, your bed is turned down and your cabin is tidied up again. Closet space was very limited so don't pack too much or you will have to leave some items in your luggage. We hand washed a few of our wearables and left them hanging to dry in the bathroom. Since there was little air circulating in our cabin, it took them a few days to dry. On the first evening on board, everyone gathered for the Welcome Aboard program at the Panorama Bar (front of the ship) where we were introduced to the crew & tour managers. Alcoholic and non-alcoholic drinks were served. Following this was the ship's safety briefing and port talk. Every evening, one of the tour managers would speak 15 minutes about the next day's schedule and tour. Dinner is usually served around 6:45 p.m. to 7:00 p.m. in the dining room at the back of the ship immediately following the port talk. These are some samples of entrees and desserts served on board. You usually have several choices of entrees and desserts to choose from and red and white wines are included at every dinner meal. Every breakfast was a buffet with your typical eggs, bacon, sausage, cold cuts, cheeses, cereals, oatmeal, toast, pastries, coffee, juice, ..etc. I did not try it, but you can also order an Amadeus Omelette which is cooked to order and looked like your typical American omelette with eggs, meat, and cheese. During breakfast, the lunch menu is already on the table for you to peruse and by lunch, the dinner menu is available for you to view. Due to time-constraints such as afternoon tours, some of the lunch meals were also buffets which included a dessert buffet such as this. The first evening's entertainer was this musician and comedian. Unfortunately, I did not find him funny. The last evening on board were a group of Hungarian singers, dancers, and musicians. I thought they were really talented. If you do not like the scheduled entertainment, you can always resort to reading, watching tv in your cabin, chatting with fellow passengers, playing games, exercising, connecting online, ...etc. Smoking is allowed outside of the boat. There is a small library on board where you can borrow a book to read. There were only a handful of tv channels and most of them were not in English. We wanted to play cards, but there was only 1 deck of cards and some of the cards were missing. And as for connecting online, the on board wi-fi was terrible and it was hit and miss. To get online, you had to ask the receptionist for a password which is written on a small slip of paper. If you have multiple devices like a smartphone and tablet, each of your devices require a different password and each will expire after 24 hours. I had better luck waiting until I got onshore to get connected. This is the game, library, or sitting area next to the Panorama Bar. Coffee and tea are available anytime by the Panorama Bar. This is the exercise room. I am not sure how many people actually used it after walking all day. Going back to the river locks... Our tour manager said we went through 25 locks through the cruise. The first few were interesting, but after that, you couldn't wait until it was over. Don't miss out on seeing Europe's Continental Divide marker, the Wachau Valley, and the sail into Budapest. There should be sufficient notice to all the passengers on the intercom so you won't miss out. A few times, they made last minute announcements to look out the window at night to see some amazing sights especially passing Linz. I wished they had made those announcements during the day so we could have prepared. Each time you disembark the boat, you will hand the receptionist your cabin key and in return, she will give you a paper pass with your name and cabin number. When you return, you hand her the pass and she will return your cabin key. This is how they track whether you are or not on board. You will also be handed a cool fruity drink and a hot wash cloth to clean your hands. On the evening we docked in Vienna, a few of us took a taxi to Cafe Sacher where they make the world famous Sacher Torte. If you are interested in doing the same, have the receptionist hail you a taxi. Depending on when you leave, the cost is between 18 to 23 Euros each way. Every evening, the next day's program schedule is placed in your room. 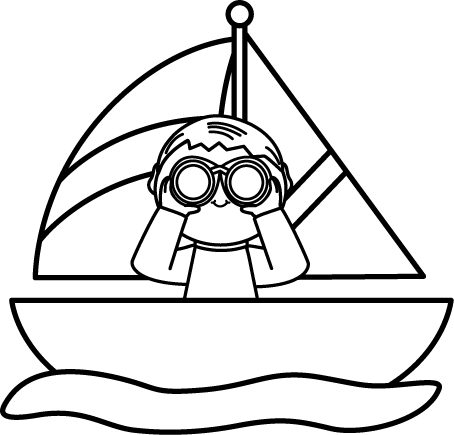 If you go to the link, I have scanned the Welcome Aboard letter, all the Daily Programs, and the Disembarkation Information. Our second full day in Prague was a trip to Cesky Krumlov, a medieval town dating back to the 13th century and now a UNESCO World Heritage Site. We had an early morning pick up of 8 a.m. from our hotel. I, along with mostly everyone else, was hoping for a quiet 2+ hour bus ride so we could nap, but our enthusiastic tour guide talked the entire time. Upon arrival into Cesky Krumlov, you can see the map of the geography of the city with its horseshoe bend around the Vltava River. Some activities you can engage in is river rafting on the Vltava River or you can sit in the outdoor restaurant and watch the river rafters go by. At the entrance to the castle, below the bridge is a bear. I was able to get this quick shot before it went into hiding. I really like the paintings on the building walls. A movie was to be filmed here and this is part of the movie set. These animals are not real and also part of the movie set. This our Gate1 tour guide who was showing us the Castle Museum. View of the city below from the Castle. After our Castle tour, we had lunch at Krcma V Satlavske or Tavern in Satlavske Street. We were placed in a cavern-like room with no windows. It was hot and cramped. Meat was cooking on the grill as we walked in. This is a sample of the lunch (included in the tour) which consisted of a choice of entrees, a soup, a drink, and a dessert. After lunch, we were free to roam around the city. At the main square was a Mustang car show. Or, you can walk and shop along the narrow cobblestoned streets. Since the streets are so narrow, many building corners had concrete barriers to prevent cars from scraping the buildings. This particular building had a more creative barrier. More city buildings with an artistic facade. Some stores with creative decorations to attract you inside. Wherever we went in Prague or Cesky Krumlov was this mole. We found out it was a Czech cartoon character called Krtek from the 1950's and 1960's. Have you seen this character before? It even went into space. 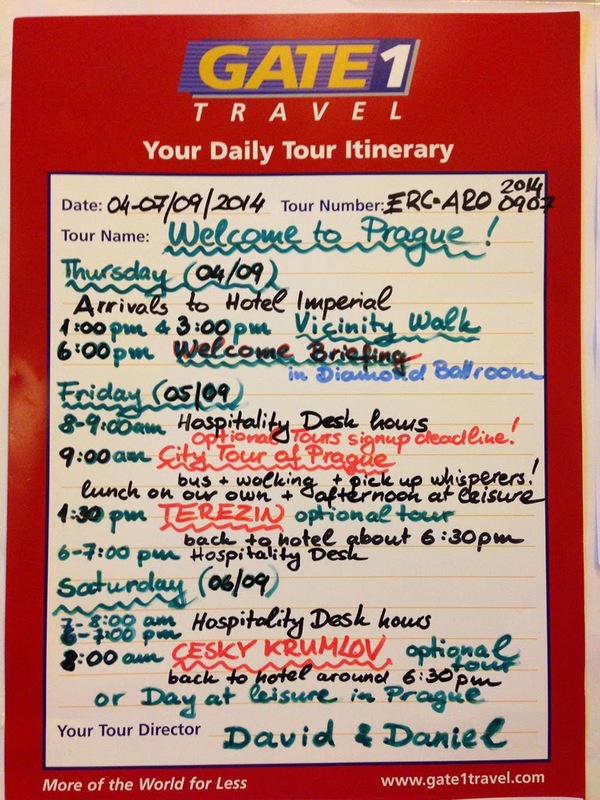 After the tour, we arrived back to our hotel with still enough time to explore Prague in the late afternoon. My next segment will include Nuremberg and Amadeus Royal embarkation. My husband and I recently returned from a 14 day Gate1 Travel Danube River Cruise with pre-cruise days in Prague, post-cruise days in Budapest, and optional tours to Cesky Krumlov, Salzburg and Schonbrunn Palace. Prior to my trip, I was only able to find a few reviews about European river cruise trips hosted by Gate1. I hope this helps future Gate1 Danube River Cruise passengers who plan to take a similar trip. Feel free to contact me if I missed anything. Performed research online about the different itineraries, read Rick Steves’ book “Europe Through the Back Door”, listened to Rick Steves’ audio tours free online. Reserved an airport shuttle service in Prague so when we arrived, someone would meet us there without having to figure out transportation. I highly recommend the Prague Airport Transfers service. You can make a reservation a day or two before leaving and pay online with your credit card. The cost is 550 Czech Korunas or about $26 USD/20 Euros. It also includes a free 4-hour Prague city walking tour. Unfortunately, it starts at 11am and conflicted with our scheduled Gate1 tour. I did not order any foreign currency ahead of time from my bank, but I did obtain an ATM/Debit card from my bank. Contact your bank and credit card company to let them know which dates you will be in which country and the rates they will charge for a foreign transaction and/or ATM fees. I also carried some US Dollars to exchange just in case my ATM card didn’t work. We used 1 large suitcase and each of us carried a backpack. Gate1’s lengthy Travel Document that was emailed to us says dining room attire is casual. Most people dressed casual to business casual for meals in the dining room, but a majority of the passengers were dressed in suits and dresses on the last evening on the cruise during the Farewell Dinner. There is laundry service at the hotels and on the boat, but I did not use them and unfortunately forgot to note the prices. Most of my laundry was hand washed. There is an iron in the hotel in Prague and Budapest, but not in your boat’s cabin. They do not allow irons in the cabin so if you need to use one, someone has to iron it for you. There is a hairdryer, shampoo, and soap in the hotel rooms and in your boat cabin. There are three available electrical outlets in your boat cabin - two in the main cabin and one in the bathroom for your electric razor. Don’t forget to bring several Euro plug power adapters and make sure your electrical device is 220v compatible; otherwise, you will need to bring power converters. 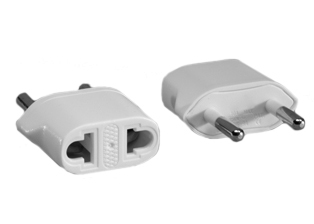 All the countries you will be visiting during the cruise will use the same Euro plug power adapters. You can get one for a few dollars at the store or online. I brought a small binocular in case I needed to use it while cruising. I discovered it wasn't really necessary because we didn’t cruise too much during the day and when we cruised into the picturesque locations of the Wachau Valley or arrival into Budapest, I was either busy taking pictures or just enjoying the view. If you plan to use your cell phone, either get a SIM card, or notify your cell phone company that you will be overseas to get on an international phone and/or data plan temporarily. I did not get an international plan and opted to hunt for wifi signals. By the way, the wifi signal on the Amadeus Royal boat was terrible, but luckily, wifi was available in town. Many of the restaurants require a wifi password, so just ask them for it if you are dining there. Although I didn’t venture into any pharmacies, we did see at least one at each location maybe with the exception of Melk because we just visited the Abbey and not the town. There are ATM machines at the baggage claim and arrival hall areas . It was simpler to use than I anticipated. Specify English on the monitor if it is not already set, put your ATM card into the slot, enter your pin, press the button to the pre-set amount in the local currency you want, and the money comes out. It helps to know the exchange rate so you know the amount you are withdrawing in US Dollars. I used the XE Currency Converter app on my iPhone. Depending on the ATM machine, you might or might not get a receipt so note how much you are withdrawing each time. It will also help to get smaller bills/coins to access the public bathrooms. The Prague Airport Transfer driver was waiting for us after we picked up our luggage from baggage claim. There were lots of people at the exit. Look for the person with the Prague Airport Transfer sign with your name on it if you choose to use this service. He spoke English, very professional, and his car was very clean. FYI, we did not have to go through Customs in Prague as it was done in Frankfurt during our layover. It was about a 20-25 minute car ride from Vaclav Havel Airport (PRG) to the Art Deco Imperial Hotel around 5:30pm on a Thursday. If you want to pay tips to the driver, money in Korunas, US Dollars, Euros, …etc. are accepted. We arrived after 6pm, checked in, went to our room to freshen up, and unfortunately we missed the 1pm or 3pm Vicinity Walking tour and was late to the Welcome Briefing which started at 6pm. Some people missed it all together because their flights didn’t arrive until that evening. In the meeting with free wine and snacks, they introduced the Gate1 tour guides, explained basic information, and discussed the next morning's activities,…etc. The most important to get out of the Welcome Briefing is to get a Gate1 lanyard with your name, time of the next morning’s tour, and find out which tour bus you should be getting on. We had about 128 passengers and they divided us into 3 buses. You were either on the Red, Blue, or Yellow bus. This information is also listed on a board in the hotel’s lobby which looks like this. The hotel is celebrating its 100th year anniversary in 2014 and it has quite a past. These are pictures of our hotel room. We were on the 6th floor and had no windows except for a skylight. The bathroom had marble floor and walls room, a shower stall and a bathtub. The tub was a little high so we had difficulties getting in and out. Not sure why we didn't use the shower stall instead. Free wifi was good and you will need to enter a code to access it. The elevator is quite small and will only fit a few guests at a time. I think the hotel's buffet breakfast was served from 6:30a.m. to 10:30a.m. downstairs in its beautiful dining room. It included eggs, bacon, sausages, cold cuts, fruits, oatmeal, various pastries, coffee/tea, juices, ...etc. Tour groups other than Gate1 were also staying at the hotel where it got quite busy so much so that some people had to be turned away to come back later when seats were available. The hotel is within walking distance to many restaurants and shops. If you like to grab a quick bite to eat, you can visit the Palladium Mall's top floor food court only 2 blocks away. Here's our Gate1 group waiting for our tour buses to arrive in front of the Art Deco Imperial Hotel for our first bus tour in Prague. We visited Prague Castle and arrived just in time to see the changing of the guards. After a tour by the local guide, we had some free time to visit St. Vitus Cathedral and the Royal Garden. After visiting Prague Castle, the bus drove us into the heart of Prague where we had a walking tour which included the outskirts of the Jewish Quarter and the Old Town Square where we hovered in front of the Astronomical Clock just in time to see it spring into action at noon. You can even venture to the top of the Old Town Hall Tower to get a view of the city. At this point, our city tour ended and we tipped our local guide and driver. Gate1's guideline for tipping is $3 per person per half day for the guide and $2 per person per half day for the driver. Since we did not participate in the afternoon optional tour, we had the rest of the day to explore on our own. We asked the tour guide to suggest a place for lunch. She did not make a particular recommendation, but told us to stay out of the touristy and pricer locations of Old Town Square and instead walk to restaurants located on the side streets. While looking around, we saw a bride and groom eating at Restaurace U Dvou Velbloudu (Restaurant With Two Camels). Well, if they are eating there, it must be good. We found outdoor seating, ordered from the English menu, and ate our first traditional Czech meal (Roast duck with red cabbage, bread, and potato dumplings). When writing this post, I discovered this restaurant is highly rated in Tripvisor. After lunch, we explored more of Old Town Square, Charles Bridge, and Wenceslas Square, during the day and night. Powder Tower a few minutes walk from the Art Deco Imperial Hotel. The Municipal House where concerts are played is also a few minutes walk from the hotel. Old Town Square area in the evening. The view of the Charles Bridge from a restaurant lookout. View of the St. Vitus Cathedral in the distance seen from the Charles Bridge at night. View of the people walking on the Charles Bridge at night. Art Nouveau architecture of the Grand Hotel Europa in Wenceslas Square. Fresh fruits, gifts, toys, ...etc. were seen at the Havelske Trziste market. Prague is inundated with eateries like this interesting cafe in the middle of the boulevard in Wenceslas Square. We found this piglet being roasted outside a restaurant. Trdelnik (Chimney Cake), a traditional Hungarian sweet pastry, was sold everywhere. Of course, we had to try it and it was delicious! If you have a sweet tooth, bakeries and ice cream stores are everywhere. This lady was making our freshly made waffle topped with strawberries and chocolate. Mmmm! Along with food, there are never any shortage of street performers like this dance couple who drew in the evening crowd. Just looking at these street artists is making me tired. This anonymous gentleman was trying to make enough money to buy an engagement ring. This concludes part 1 of my Gate1 Danube River cruise report. At this point, I don't know how many more parts I will write or even if this report generates any interest, but I hope it does. In my opinion, Prague was my favorite city on the 14 day trip. I wished I had more time to explore the rest of the city, but I was happy I was able to visit the city that has been on my bucket list for a long time. The next segment will be on the optional tour to Cesky Krumlov and the embarking on the Gate1 Amadeus Royal boat which would be our home for the next 7 days.